Converting your website visitors into paying customers doesn’t just happen by accident. There are so many things you can do to increase conversions on your website. In this episode, we’re going to be going through eight very simple tweaks you can make on your website that will transform your readers into leads. Are there a simple set of rules to increase website conversions? Time Stamps: In a rush? Get to the section you need to below! 1.12 – What is a conversion? 2.28 – Is there a simple set of rules to increase conversions? 3.24 – What can we do with our websites to get warmer leads? Thanks for listening to our episode. If you found this episode useful, please feel free to share it via social media using the links above. If you want to know about search engine optimisation (SEO), website conversions, content marketing and website copy, then join our FREE Facebook Group. We would love it if you subscribed to our podcast and left us an honest review. This helps us reach more people and produce more podcast episodes. If you have any questions about this episode or you want us to cover something new, then contact us on hello@jammydigital.com or leave a comment at the bottom of the page! Martin: Welcome to episode eight of the Make Your Mark Online Podcast. 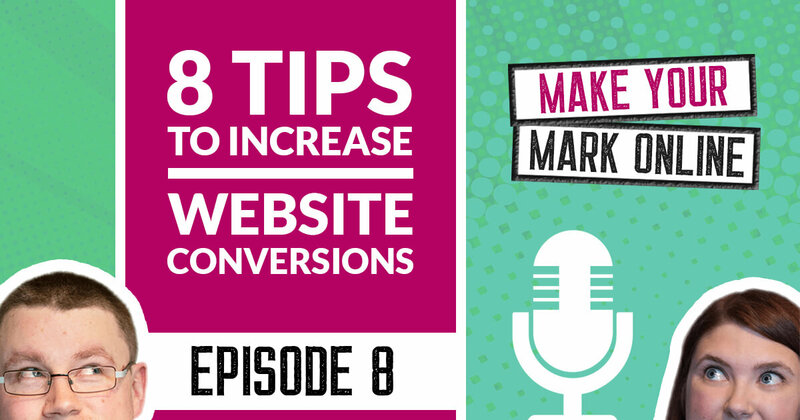 In today’s episode, we’re going to talking about conversions, and we’re going to give you eight simple rules to follow to improve the conversions on your website. Now, before we get into the show, I just wanted to remind you that we are hosting a brand new webinar on the 6th of September, and it’s going to be all about SEO and how to improve your search engine rankings for your website. It’s going to be really fun, isn’t it? Lyndsay: Yeah, yeah. Really excited about it. It’s going to start at 8:00, that’s UK time, or 3:00 p.m. EST. 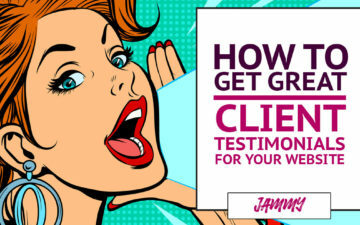 Make sure you pop it in your diaries, and go and visit the webpage which is JammyDigital.com/webinar, to actually get your unique link for the actual webinar, because you won’t be able to get in without that. What is a website conversion? Martin: Yeah, and make sure you turn up early as well, because we do only have a limited number of seats, so it’s really important you show up 15 minutes later. We’ll be there. Okay, let’s get into the show. So Lyndsay, when we talk about conversions, what do we actually mean? What is a conversion? Lyndsay: It’s a good question, actually, because we work within obviously web design, so we talk about this quite a lot. But I think it’s a little bit of a jargony term really, because it’s not quite obvious what it is. But it’s essentially up to you, the business owner, what you classify as a conversion. It’s getting your reader of your website from the status of reader and actually taking some action. Lyndsay: You decide what the action is. That could be signup to your email list, it could be get in touch with you, it could be to buy something from you. Ultimately, that’s actually your decision, but it’s essentially about getting your reader to take some form of action with you. Martin: Okay, so it’s about taking someone from potentially a cold lead on your website to making them into a warm lead or maybe a hot lead where they’re ready to buy. Martin: It’s about taking somebody through that funnel really, to become more of a customer or more of a potential customer at least. Martin: Okay. That makes sense. It’s pretty straightforward then. It’s just yeah, there’s lots of info on the internet that makes it more complicated than it needs to be. Lyndsay: Yeah. It doesn’t need to be complicated at all, no. Is there a simple set of rules to increase conversions? Martin: Okay, that’s pretty self-explanatory then. Okay, so with SEO, and with web design, we like to give quite a few tips away. In terms of action steps that our listeners can do with their websites, is it easy to give that away with conversions? Do we have a simple set of rules that people can follow to be able to improve their website conversions? Lyndsay: Yeah. I mean, broadly speaking, we do go through this with our clients and also in website critiques as well, about how you can actually improve conversions. Now, conversion, it is all about testing, so your business is unique. Your audience is unique, your brand is unique, so one thing that might work for one person might not work for the other, but in this episode we’re going to be speaking very broadly about what will work for 99% of businesses. Everyone will be able to get something from it. Martin: Okay, that makes sense. Okay, so let’s get into the juicy bits then. What can we do with our websites today to improve the conversions? How can we get people to become a warmer lead? Lyndsay: Yeah, well there’s plenty of simple things that you can do, and I’ll focus in this episode on really simple tweaks that you can make. You can probably just go in today to the backend of your system and make these tweaks. The first one is your buttons. Now, what I mean when I say buttons is essentially mean your call to action buttons. Lyndsay: This might be like, “Get in touch with us” or, “Sign up to our webinar” or any of those kind of buttons on your website. It’s about actually making them really stand out, because making them stand out really does improve conversions. You see this, I always give this example of Amazon. Amazon is a really ugly website. No offense website. Not that they’re going to be bothered, they’re making a lot of money. Martin: Yeah, don’t sue us, Amazon. Please. Lyndsay: We can’t afford that. But if you look at their website, it isn’t the prettiest, and their buttons really stick out like a sore thumb. They’re not attractive at all, but they get people to click, and that’s what you want to be doing on your website in a way. I mean, we see a lot of people that make their buttons really go in with their color scheme, they’re nice pastely colors, you can’t really tell. Lyndsay: Or, they don’t have any color in the background of them, they’re not in a box, it’s just a text link and all things like that. Martin: Yeah, ’cause sometimes they don’t actually look like buttons. Lyndsay: Yeah, suddenly you accidentally click. Martin: ‘Cause it blends in. Yeah. Lyndsay: Because it blends in so much, and I think this is about really making those call to actions stand out, and that will definitely improve conversions. Lyndsay: On a broad level. Martin: … it’s just about making it stand out. Lyndsay: Yeah, on a broad level, no. Actually there’s a pile of research to do with button color psychology. If you’re a geek like me, it’s all very interesting. But it is dependent on the business. Once you’ve actually made your buttons stand out on your website, then you can start testing things. Is green better? Is orange better? You can start testing these things out, and believe me, big corporations spend hundreds of thousands of pounds actually doing this. Lyndsay: You can certainly do it yourself, but the first step is just make those buttons stand out, and it’s amazing how many people just don’t do that. Martin: Yeah, so that by itself is such a big action step for our listeners to be able to go onto the website now, change the button colors, make sure that they stand out with all the other stuff on the website, and then see some improvements, which is great. Martin: Fantastic. Okay what else have we got? Lyndsay: Another thing that we constantly say, don’t we Martin, is about sign up to my newsletter? We see it all the time, don’t we? Martin: Absolutely love it, we do. Lyndsay: I think we’ve mentioned this before. I probably mention it on every episode really, but a lot of people say on their website, “Sign up to my newsletter to get my weekly thoughts” or something like that. We always say, “No one cares.” Unfortunately, as much as we’d love to think that people care about our monthly newsletter where we talk about the award we won in 2014 and our new office plant, no one does care, unfortunately. Martin: To be fair, you are partial to the nice office plant. Lyndsay: I am. Well, I always kill them, don’t I? Lyndsay: I always buy them and kill them. I could put that in a newsletter, no one would read it. But yeah, unfortunately no one really cares that much about your updates in your business. Now, you might, I don’t know, you might be giving away the best content ever in this newsletter. I don’t know, but if you’re calling it a newsletter, I’m just going to be bored. Lyndsay: The way to increase conversions in terms of email signups is to offer something for free in exchange for someone’s email address. This could be anything. It could be an eBook, it could be a video series, could be a guide, could be anything. I’m not saying it has to be really extensive. Just give away something. Martin: Okay. That’s great. We’re talking about making it I suppose, if we’re making it really clean and simple, this information, it’s about making it customer focused rather than focused on what we have, which is our newsletter, our news, our information, our updates, and about this is your guide, this is your free giveaway, this is your action step, this is your cheat sheet. We’re talking about flipping it, aren’t we? Lyndsay: Yep, absolutely. I absolutely agree with that. It is taking the focus from us and putting it onto them. When you make something about the customer, and make them feel special and that they’re going to gain something from it, then you’re going to increase conversions. Lyndsay: Again, this could be tested so once you’ve gathered that, once you’ve got rid of the newsletter, you’re replaced with something else, perhaps a cheat sheet as you said, you could test different things and think, “Well, actually a video series works a lot better for conversions and getting email addresses than my cheat sheet.” You can test different things, but the first step is get rid of the newsletter, replace it with something juicy. Martin: Yeah, unless you’re Richard Branson, newsletter isn’t that appealing. Lyndsay: Yeah. I mean, I have seen the big guys do it. When you are Richard Branson, or any number of these huge influencers, yes you can get away with saying, “Sign up to my newsletter” because people genuinely do have an interest in your daily life and what’s going on, but until you’re there, until you’re Richard Branson, just hold off on that. Martin: Okay, no problem. Okay, so before you mentioned getting someone to get in touch with us as well, and I suppose that could be related to email signup forms as well, but what tips do we have in regards to getting people to fill out forms on our website? Lyndsay: Yeah, that’s a really good one, because we’ve seen from … We’ve done hundreds and hundreds of website critiques haven’t we, over our years? And we’ve seen a lot of people put forms on their website that are very long. They ask for name, address, your pet’s name, your blood type, and your favorite film. Lyndsay: No, they don’t really ask that much, but they ask for so much information. I mean, seriously, just completely useless information. Ask yourself, do you really need someone’s address when they’re filling in your form on the website? Are you going to send them a letter? Is it 1952? Well, maybe not that early, but you know what I mean. Do you really need to ask all these details? Lyndsay: Think about what you actually do need to ask, and this is good for obviously GDPR, as well, because you have to ask for the maximum amount of data that you need to actually do the process that you need to. If you don’t need an address, don’t ask for it. If you don’t need someone’s website URL, don’t ask for it. Lyndsay: There’s no point. It’s tempting to get as much information as possible, but if someone sees a big huge form and they think, “I can’t be bothered with that. I’m going to come back to it later” and they’ll just hit the backspace button. Martin: Okay, and I suppose as well, as we noticed in the past, is there can even be a difference between asking people to fill out two fields on the form versus three fields on the form. I’ve seen MailChimp as well, their standard signup form for an email list is actually first name, last name, and then email address. Now, that last name you have to ask yourself, is that actually vital? Do we need somebody’s last name or can we speak to people normally on our email list by just saying, “Hey Lyndsay, here is the thing you requested.” Do you really need a last name? Lyndsay: Yeah, exactly. It’s the same with asking for Mr. Or Mrs. Or Ms. Like, do you really need that? Again, are you writing them a big long letter? Because most of the time, you don’t refer to people as Ms. Cambridge or Mr. Huntsbatch in email, so it’s completely useless. Yeah, have a think about that and make it as short and easy for your end user as possible. Martin: Yeah. On the flip side, I would say that there is an argument to say that you should get more than an email address, so asking for somebody’s first name actually might help as well. Lyndsay: Yeah. I definitely agree with that actually, because yeah, you would need a first name and an email address. Don’t just ask for an email address, ’cause certainly when you’re emailing people, you want it to be personal, so you want to say, “Hi Lyndsay” or “Hi whoever.” You don’t want to just say, “Hi subscriber” because that just makes it very, very impersonal. Martin: I’m sure it works, I’m sure you’ll probably get more signups, but how personal can you be if you’re just asking for an email address? Lyndsay: Yeah. It’s fine in that balance, but yeah definitely. Martin: Exactly. Okay, perfect. What else can we do to improve the conversions on our website? 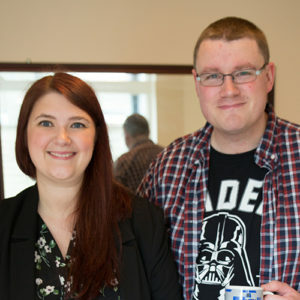 Lyndsay: I think another thing that we try and push a lot of people to do, and they’re sometimes quite reluctant, is put pictures of themselves on their website. This is particularly important for personal brands, but for any business I would argue, to put your picture on your website. There’s nothing worse than going to a website and feeling very cold and clinical about it. Lyndsay: We hear the phrase all the time, “People deal with people.” We want to actually see who we’re dealing with. Martin: Okay, so this is a really interesting one, because when we talk about conversions, we talk about signing up, we talk about buttons, we’re talking about email lists, but this one is a bit different, because it’s like, well, before they even get there, they need to trust you. You they need to know you. They need to build up some kind of rapport via your website, wherever they are in the world, and actually getting somebody to fill out an email list and sign up to do this or buy a product is a lot easier if you think about it from a person to person perspective, which is why having an image of yourself is so important if you’re a personal brand. Lyndsay: Exactly, exactly. As you said, it’s just all about building trust, isn’t it? You have to get that trust built before someone takes action with you. A good way of doing that is obviously featuring your image on your website. Martin: Okay. Perfect. That will absolutely help someone take the next step with with you. Martin: I agree. Okay, no problem. What else can we do? Lyndsay: There is another thing that people do in the fact that it’s not even about button colors now. It’s the fact that there is no call to action on your website at all. A lot of people rely on the fact that they just have a contact me button perhaps in their main menu header, but they have nothing on their website that tells people what you want them to do. Martin: Yeah, that direction you want people to take. Lyndsay: Exactly. It’s really not good in terms of conversions. What you want to do is actually tell people what you want them to do. Be a bit bossy about it. Say, “Get in contact with me now” or even just signposting them around your website. We always say on the homepage, signpost people where you want them to go. Lyndsay: If you’ve got three different services, feature those three different services on your homepage, and get people to the relevant pages that they need to go to. I always say think of yourself like a traffic, like you’re directing traffic and you’ve got a little whistle in the middle of a street. Lyndsay: Imagine that’s your website and you’re the person who has to direct the traffic. You need to be really clear, “Okay, you need to go over there, you need to go over there, you need to go over there. You can get in touch with me if you want” and you need to be that explicit with people. Martin: They’re reading the blog post, they’re actually consuming the content, and then they see a call to action which says, “Please go over here if you’re interested in getting an SEO webinar.” That’s what we’ve done and that’s something that you could potentially do, especially if you have a relevant offer on now that might not be there in the future. You can still go back through your content, and start redirecting these people while they’re consuming your content. Lyndsay: Yeah, that’s a really good point, actually, Martin. Because a lot of our content gets a lot of our traffic and you might be the same. You might find that your blog content does get a lot of your traffic, so don’t miss also your blog posts for those clear call to actions. A lot of people write these amazingly wonderful blog posts which are full of great content, and then there’s nothing for the audience to do at the end. Lyndsay: Or even you can put it in the middle of the blog post, where you have, “Sign up for my email list” and give something in exchange for that. But to have a purpose for every blog post, have a call to action, yeah, is extremely important and that’s another really good point. Lyndsay: Another thing that’s important for your website is something that’s nothing to do with design, but it will really help conversions, and that is something that we recommend now that every single website has, and that’s an SSL certificate. Lyndsay: Now, this was mainly applicable for more eCommerce websites, because people were going in and they were paying for products and an SSL certificate just shows that your website is secure. You’ll notice a little padlock in the top left hand corner saying it’s secure. But now I’d recommend that all websites have it. Because it makes people feel more secure when dealing with you. Martin: Yeah, and obviously Google are making people aware now that your website isn’t secure if it’s not showing the green padlock, if you haven’t got yourself an SSL certificate. It will actually prevent people from becoming a conversion on your website if you don’t have it. It’s important because people are expecting to see it. Lyndsay: Yeah, exactly, exactly. I think people are becoming more and more aware of it. Martin: Yeah, with GDPR, which we hate talking about it, but people have got that in the back of their mind, that when they fill out their name and email, how secure is this data? Is it just going to you for what I want to give you for, or is it potential that your website’s going to be hacked? I mean, not secure is a very, very strong statement that somebody might be reluctant to even spend anytime on your website if it says it’s not secure. Lyndsay: Exactly. Just don’t give them an excuse to leave. Lyndsay: A nice and easy fix, as well. Martin: Course it is, yeah. Perfect. Lyndsay: Another thing that you can look at as well, and we’ve talked about this before actually, in episode five of our podcast, is a big, bold statement. Now, a big, bold statement is essentially the first phrase or sentence that your end user will see when they land on your homepage. It’s normally in the first third of your homepage, above the fold, and it’s essentially a summary of what you do and who you help. Lyndsay: If you don’t have that on there, it’s crazy how many people don’t have this, because it’s really not clear what it is that they do, is it? Martin: Yeah, and much like the image of yourself as well, this becomes well before a conversion takes place, but it’s absolutely vital. If somebody clicks on your website, or finds you online, or however they get to your website, if you don’t have a clearly defining statement that explains who you are and why they should care, then they’re not ever going to get to the level where they are giving you their email address, or buying a product for you. Martin: It’s more about the psychology of making people feel welcome when they get to your website, without using the word welcome, which we hate. It’s about making sure that they’re in the right place, so that when it comes to a conversion, they’re much more likely to take it. Martin: Okay, perfect. That’s a really, really good point. That brings us onto the final point. What’s this last thing that’s really important that people cover on the website? Lyndsay: Okay, so the final point that we want to talk about is something that we see quite often on websites and that’s that there’s too much clutter. There’s just too much crap on your website pages. What we advise everyone is to make sure that every single page on your website has a purpose. There is a reason why that page is there, there is one topic that that page is talking about, and there is a clear call to action of what you want someone to do. Lyndsay: We see this on homepages quite a lot, where people want to tell you all about all their services that they offer, all about who they are and why they’ve started this business. Everything from all their social media links to how to contact them, all these different things rammed into a homepage. It’s just so overwhelming for the end user, they just don’t know what to do next. Martin: Yeah. It’s like having a business card that’s just completely filled with text and content. It’s not the purpose of a website, is to just dump all that information on people. Lyndsay: Yeah, exactly, exactly. There’s just this temptation in trying to convert people, we speak too much. Imagine a sales call and you’re going on and on and on and on, and your person that you’re talking to, your customer’s droning out, because you’re so desperately trying to convert them that you’re actually putting them off by telling them all this needless information. You just need to be very, very clear and like I said earlier, make sure every page has a specific topic and a specific purpose that you want to talk about. Don’t start going on about lots of different things on your pages. Martin: Yeah. It’s definitely a case of less is more, and understandably when we’re talking about business and we can’t to convince people to become customers, we think that more information is going to be better. The more informed that people are, the better, which means that it needs to be an extremely long page, filled with content, filled with images, filled with links, and then what happens is we dilute the main messages that we want people to take and the next steps we want people to take. Lyndsay: Yeah, definitely. I think this is also an argument of where your content should come in as well. Because a lot of people who write all this extra crap that goes onto their homepage or main webpages could actually be made into really great content. People talk about their processes, or what they do during their service, whatever that might be. That could also make great blog posts if you want it to. Not everything has to be a webpage. Think about what could also make a great blog post as well, and don’t be scared to make it into a blog post. There’s no problem with doing that. Martin: Okay, so clean, simple, directive design, as in which direction you want people to take, is much better. Martin: Okay, perfect. Great tips. I think our listeners have probably got a few notes there that they can actually go back to their website and actually make some adjustments. Lyndsay: Yeah, I think it’s difficult with this one, because there is so much we could talk about, and like I said, for button color, I could just talk two hours just about button colors, but these are meant to be very broad strokes, about what you could do really quickly to increase some conversions on your website. Martin: Yeah, and you could literally talk about buttons ’til you’re blue in the face, but I don’t think our audience want to fall asleep right now. Lyndsay: No, they definitely don’t. Let’s not do that to them. Martin: Especially not if they’re driving. Okay, perfect. That was episode eight of the Make Your Mark Online Podcast. I hope you found it useful. 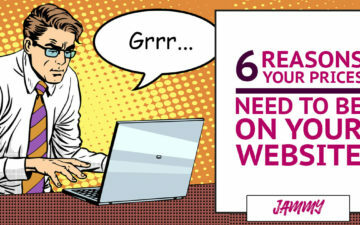 Please don’t forget to register for our webinar in the next few weeks on the 6th of September, and that’s JammyDigital.com/seo-webinar, or /webinar. We’ve got both, we’ve covered ourselves. Lyndsay: We have both, we’ve covered ourselves, yes. Martin: Definitely. Like I said, there are limited spaces available and please turn up early to get a space. That’s it. We’ll see you next time on the Make Your Mark Online Podcast.